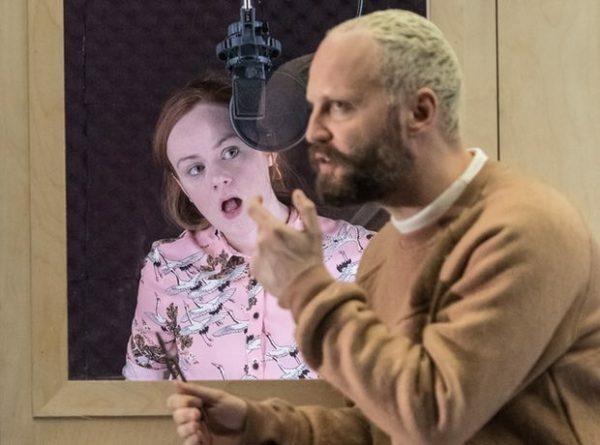 ‘Hipster’, not ‘ipster’: Adam Bruce reviews Headlong’s modern update of Bernard Shaw’s famous work. Pygmalion at the West Yorkshire Playhouse. Despite the fact that some of his stage directions are exceptionally precise and lengthy, the plays of Bernard Shaw seem to have an enduring appeal. Whether or not the Fabian socialist would approve of his plays being conceptually altered is another thing. Would he have ever dreamed of seeing a hipster Henry Higgins in his play Pygmalion? Who knows… But if you’d like to see that – because, why not? – then Headlong Theatre’s co-production with West Yorkshire Playhouse and Nuffield Southampton gives you just that chance. For the few not familiar with Pygmalion, the play follows the efforts of a phonetics professor named Henry Higgins (Alex Beckett) as he attempts to teach the working class Eliza Doolittle (Natalie Gavin) how to speak ‘properly’ in order to win a bet. With the help of Colonel Pickering (Raphael Sowole) he teaches her the art of being a lady, but isn’t prepared for what happens when he falls in love with his creation. Sam Pritchard’s directorial concept brings the play into a modern, recognisable world where Shaw’s original social criticisms resonate firmly with our time. Gavin draws upon our shared home county of Yorkshire’s stereotypically thick accent in her initial portrayal of Doolittle, brightly contrasting with Beckett’s crystal clear southern accent in his portrayal of Higgins. With this in mind, Headlong’s production uses Shaw’s piece as a weapon with which to remind audiences of the quiet dominance of classism and discrimination in today’s world. Beckett has a charismatic charm, lightly seasoned with a dash of arrogance and childlike energy to give him an ever-present appeal that keeps the audience hooked. He’s poised to act as a vessel for us to laugh both with and at, and the audience takes great delight in evaluating his social blunders with the new relevance and resonance of Shaw’s text underpinning them. The same can be said of Gavin who employs an abrasive persona at the start. By the time she’s finished with Higgins, she’s quite the opposite, and both performers harmoniously level out to give us a satisfyingly poignant conclusion. All of this takes place in Alex Lowde’s gorgeous set. Headlong have always had a penchant for designing sumptuous, aesthetically pleasing sets, but this has to be one of their best yet. On the surface, Lowde’s set might look fantastic – white walls, minimalist furniture and Perspex rooms on struts – but there’s much more to it than pure visual delight. The set cleverly and efficiently serves the directorial purpose, and both draws audiences in and pushes them away when required. Lowde’s costume designs are also stylish and sleek, using the hipster image to show an elevated, exclusive and aspirational social group in the modern world. The visible wooden struts holding the set’s walls up remind us of the artifice of theatre and the room in any text for reinterpretation. Shaw might have deemed such an act unnecessary, arguing his play already has the right ingredients to succeed, but this small detail is just one example of how this production re-invigorates his classic. Pygmalion is on until 25th February 2017 at the West Yorkshire Playhouse. Click here for details.